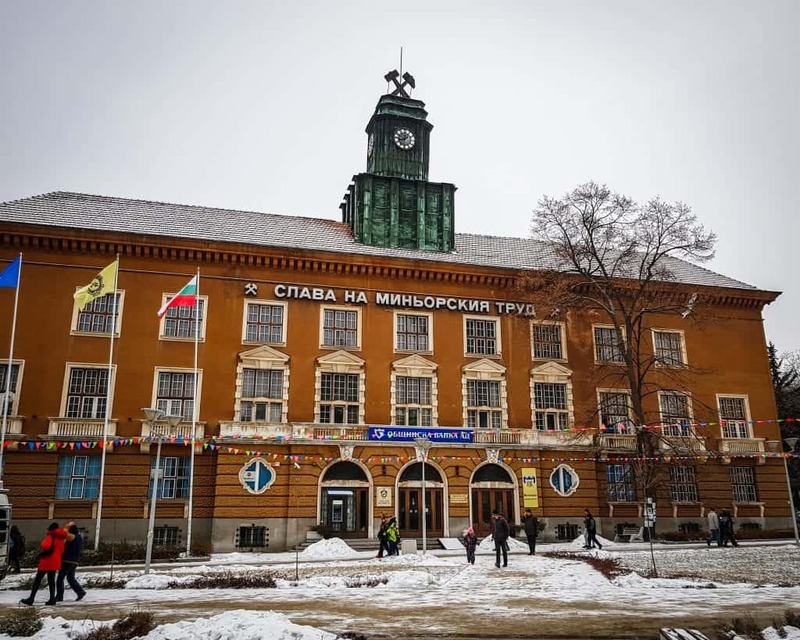 Pernik is the second largest town in Western Bulgaria after Sofia, and there are many reasons why a visitor to Sofia would want to visit. The most popular reason is to attend the Surva Festival of Masquerade Games, which is a gathering of Kukeri dancers from across Bulgaria, held here annually in January. 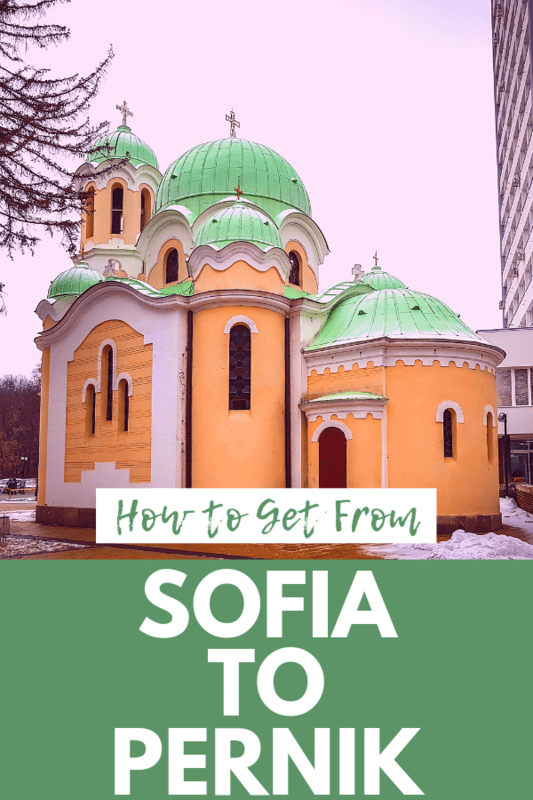 Here’s everything you need to know to get from Sofia to Pernik by train, bus, and taxi, including information on how to get back from Pernik to Sofia. 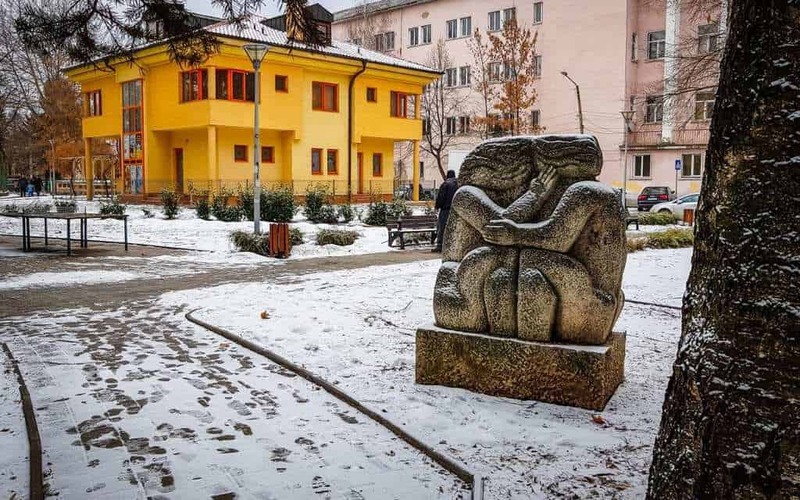 The trip from Sofia to Pernik is a quick one, and you have three good options for getting there. We don’t suggest you rent a car if you’ll be attending Surva, as there isn’t good public parking available during the festival. If you will be traveling to Pernik at another time, you can choose to rent a car instead of taking public transportation. 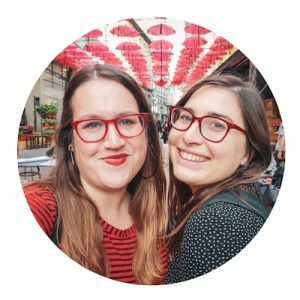 Getting from Sofia to Pernik by train couldn’t be easier! There is about one train every hour, sometimes more, and you can check the schedule easily on the BDZ website (just pick the main Sofia and the main Pernik stations, as the other stations are outside of the town centers). The first train from Sofia to Pernik leaves around 5 AM and the final leaves around 11 PM, so there are plenty of trains throughout the day. The train takes about one hour. 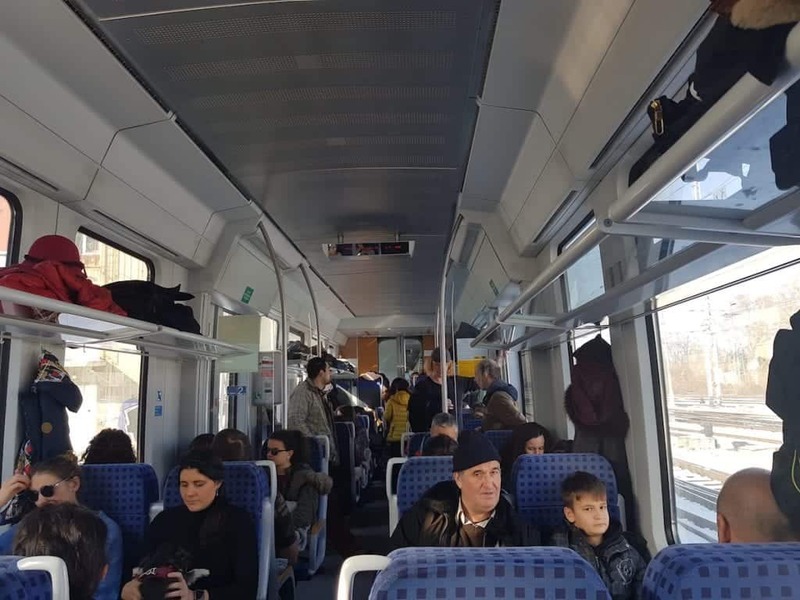 If you are going to Pernik during Surva, they add additional train cars to the trains to increase passenger capacity and encourage people to take trains rather than drive to Pernik. I did not need to book train tickets in advance, I just bought them at the station (go to Window #17, pictured above, next to the Information Booth) about 20 minutes before. If you are in a rush, you can buy them on board the train at a higher price. 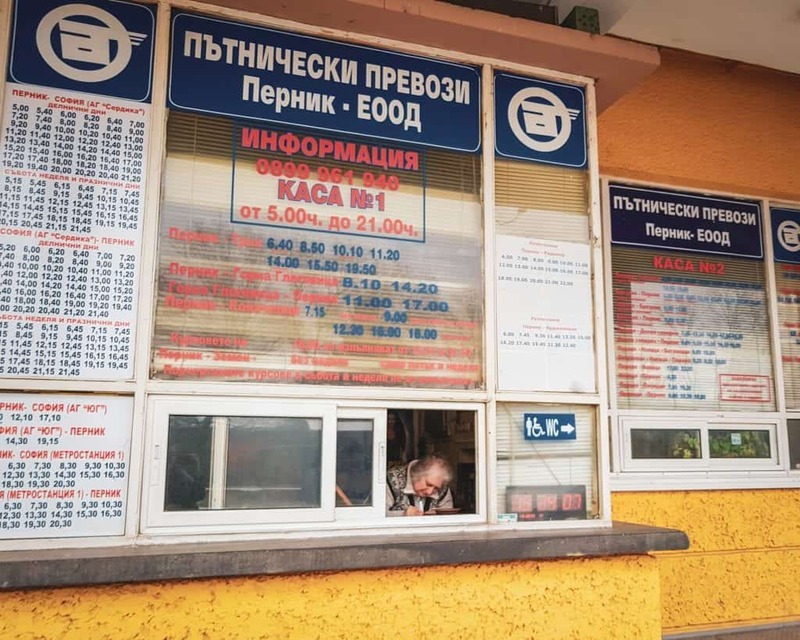 One way from Sofia to Pernik costs 2.20 leva (a little more than 1 euro), or you can buy a full-day Sofia-Pernik ticket that will cover your return journey as well for 4 leva. I recommend doing this as you save a little bit of money but also, you can avoid buying a ticket at Pernik on the way back, which is nice because that train station is smaller than Sofia’s and therefore it can feel quite crowded. Buses leave about once an hour from Sofia’s Serdika Station. This station is in between Sofia’s train station and the Central Bus Station. If you accidentally go to the wrong station, it just takes a few minutes to walk in between them. The bus also leaves from the Russian Monument. Tickets to Pernik cost about three leva (about $1.80 USD). Multiple companies run this route. You can use the Pernik Municipal Bus, or you can pick another company. I used the Pernik city bus, and it was very easy. This is technically called a Marshrutka because it’s a smaller minibus. Each company operates their own ticket window at the station, so it can be a bit confusing. Give yourself time before your bus to find the right window and get your ticket. If you see the bus, it’s possible to buy your ticket directly from the driver. Note that marshrutkas fill up, and there will more than likely be people standing for the entire ride as well. These buses are first come, first serve. The ride takes about an hour depending on local traffic. It’s not a scenic route, which is unusual for Bulgaria. There won’t be much storage space on the bus. If you need luggage stored, ask the driver and they will put it in the back. They may charge an additional fee for this. If this is your first bus ride in the Balkans, read up on our Balkan bus tips. For our first trip to Surva, my fiance and I decided to take a taxi. 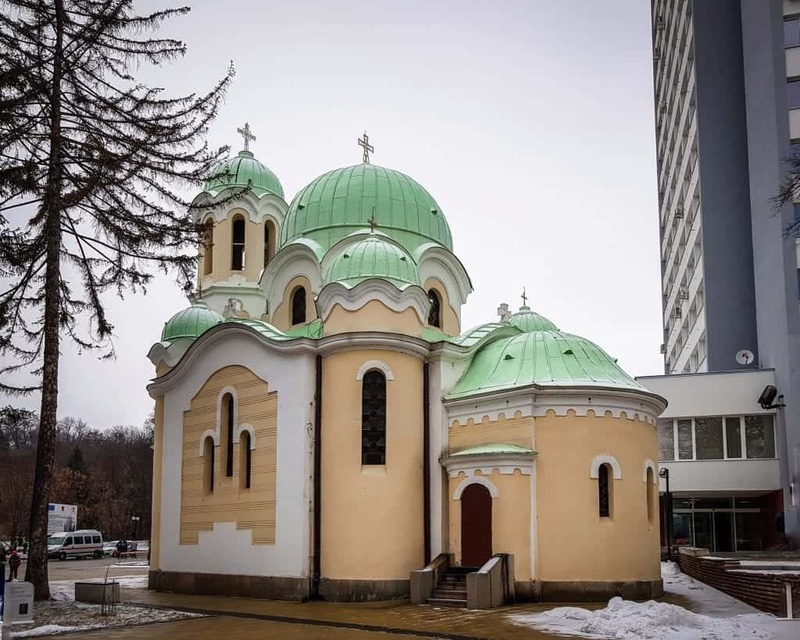 Even though I’ve taken hundreds of fo taxis in Sofia, there are a few extra things that you need to know to get all the way out to Pernik. 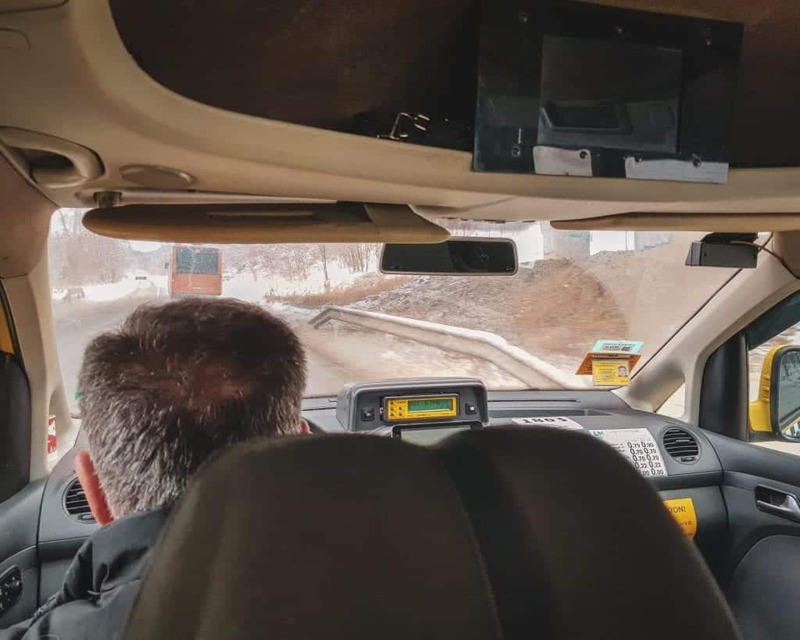 If this will be your first taxi ride in Sofia, make sure to read our Sofia taxi guide so you don’t get scammed. To get a taxi to take you out of town, you can’t use the Yellow Taxi app. The order will cancel on you after you place it. This isn’t drivers choosing not to take you, it’s the actual app canceling the order out. Instead, call and order a taxi over the phone and tell them you want a ride to Pernik. You will have to give the operator a drop-off point. I would tell them either to go to Pernik center if you don’t have a specific address. If you don’t have the ability to make phone calls, ask your accommodations to call for you. You can also ask a restaurant to call on your behalf if you are a customer. We used OK Taxi. 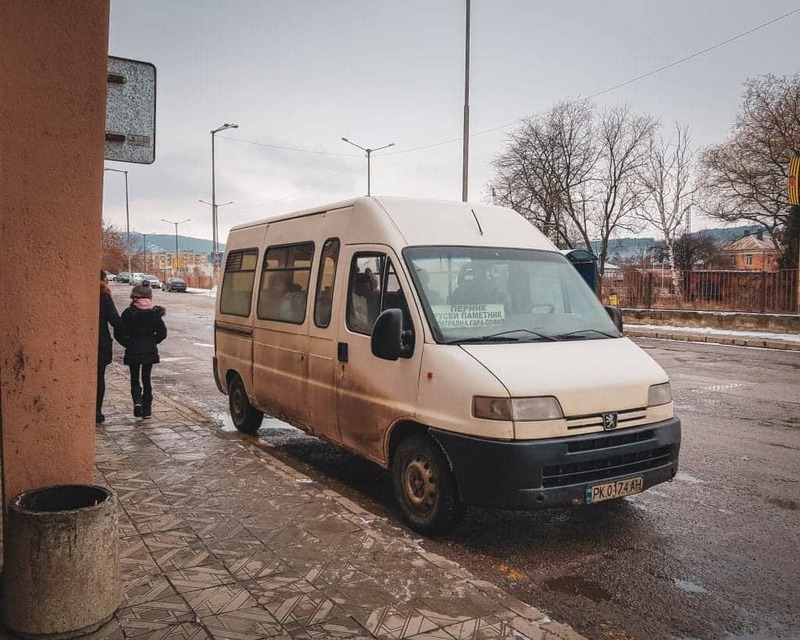 There was a seven leva surcharge for the trip to Pernik plus the metered rate. From my place in Lyulin, the meter rate was about 26 leva. With the surcharge, it should have been 33 leva, but my driver refused to give me change when I handed him 35 leva. Since I would have tipped him the difference anyway, it was fine. Thus my total taxi cost to Pernik was 35 leva or about 20 USD. This will be slightly more if you’re coming from the center of Sofia, so expect the total cost to be between 30-45 leva. You will need to pay in cash unless you arranged with the taxi company to pay with credit card ahead of time. If you are paying by credit card, double check that the driver has a POS system before you start the trip. The ride itself was not scenic (closer to ugly) even with snow everywhere. This is pretty unusual for Bulgaria, where most drives are beautiful. The benefit of taking a taxi is that it’s extremely convenient and you get to avoid being crowded on the bus and waiting to leave on the train or bus schedule. It is obviously much more expensive. You can split the cost between 2-4 people since there’s no additional cost for up to four total passengers. The total taxi time is about 45 minutes to an hour, depending on what part of Sofia you are coming from. If you take a taxi from Sofia to Pernik, have the driver drop you off at your desired location. If you’re attending Surva, you can have the driver go all the way to the beginning of the festival. Even if your driver doesn’t speak English, they will more than likely have no problems getting you to the festival if you say you need to go to the center. In Bulgarian, center is pronounced with a ts sound at the beginning, tsenter. If you arrive at the bus or train station, you can walk to the center of Pernik in about ten minutes. Have the city downloaded offline in Google Maps ahead of time if you won’t have data on your phone. If you want to have a taxi drive you, it’s less than five leva to the center. Just triple check that the meter is started and have cash ready. If you plan on staying in Pernik, your accommodations can help you with the best directions to get to their location. Pro Tip: If you will be staying in Pernik for Surva, book your hotel as far in advance as possible. Our recommendations on where to stay in Pernik are below. There aren’t many hotels, and they fill up months ahead of time. 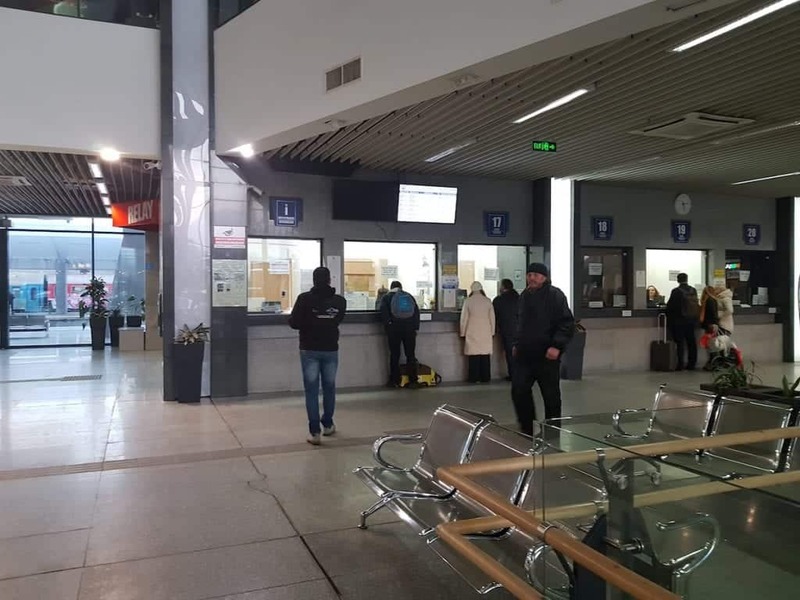 Getting back from Pernik to Sofia is quite easy, especially if you followed my advice in the previous section and bought a full-day Sofia-Pernik ticket for 4 leva, as then you won’t have to wait in line. It was a bit unclear to me which track the Sofia train left on so be sure to ask if you are confused. During Surva there will be a policeman at the station helping to direct passengers if needed. The train back to Sofia will take about one hour and some make two stops in Sofia, one at Sofia Sever (North) first then followed by the main train station (Sofia Central Station / Centralna Gara). If you are staying in the city center you will want to get off at Centralna Gara so be sure you don’t get off too early. 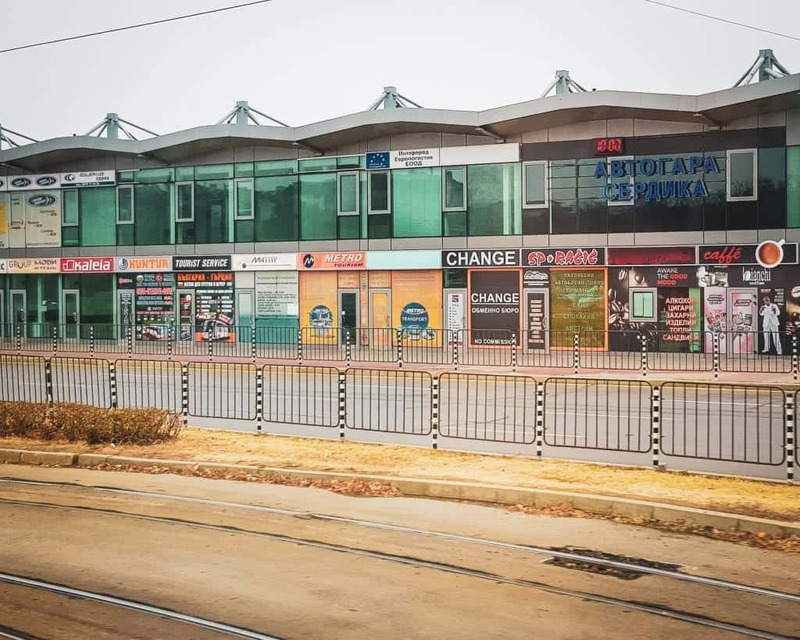 If you are staying in the Northwestern part of Sofia, Sofia Sever may be a closer station for you, but not all trains will stop there so be sure to check online on the BDZ website. Leaving Pernik by bus is simple. Buses leave frequently from the Pernik Bus Station (Pernik Avtobus). You can use Google maps to walk to the station. If you don’t have data, download the city map for Sofia and Pernik so they are available offline. We chose to take a taxi from the city center to the bus station to avoid walking in the cold after being outside all day. The taxi cost less than four leva or about 2.30 USD. When we arrived at the bus station, we purchased our tickets at the window. The cost was three leva each, or about $1.80 USD. 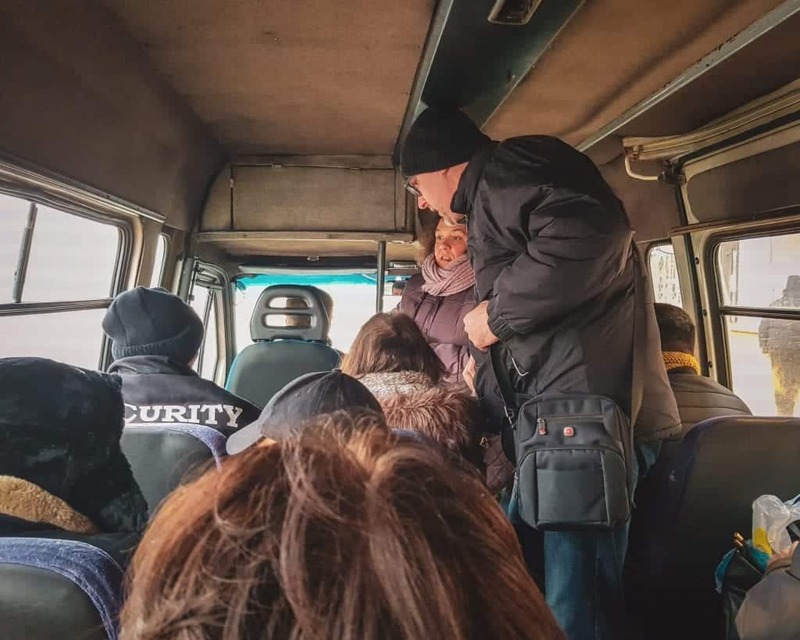 We then piled into the marshrutka that was already waiting. Expect that every seat will be taken. When the seats are full, some passengers may choose to stand instead of waiting for the next bus. The ride from Pernik to Sofia takes about an hour depending on traffic. The bus will stop whenever someone wants out or if there are people waiting at bus stops to get on. 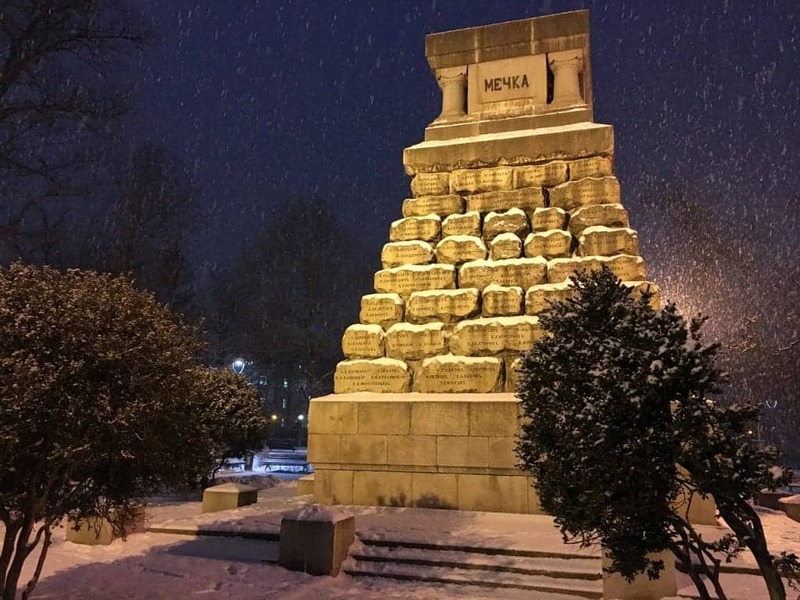 The two main stops in Sofia are the Russian Monument and Serdika Bus Station. This is the final point of the bus route, so everyone will get off here. To arrange a taxi ride back to Sofia, you will want to call and order a taxi rather than flagging one on the street. Ask your accommodations to call for you if you don’t have the ability to call yourself. If you need one and you are not staying overnight in the city, you can have a restaurant or cafe make the call. If you do have to flag one down, make sure you have the Sofia city map downloaded offline so you can help your driver navigate once in Sofia. You’ll need to give the taxi driver the address where you want to be dropped off in Sofia before you leave. Make sure that the meter is running before you leave, and keep an eye on it to make sure it is ticking along at a normal pace. 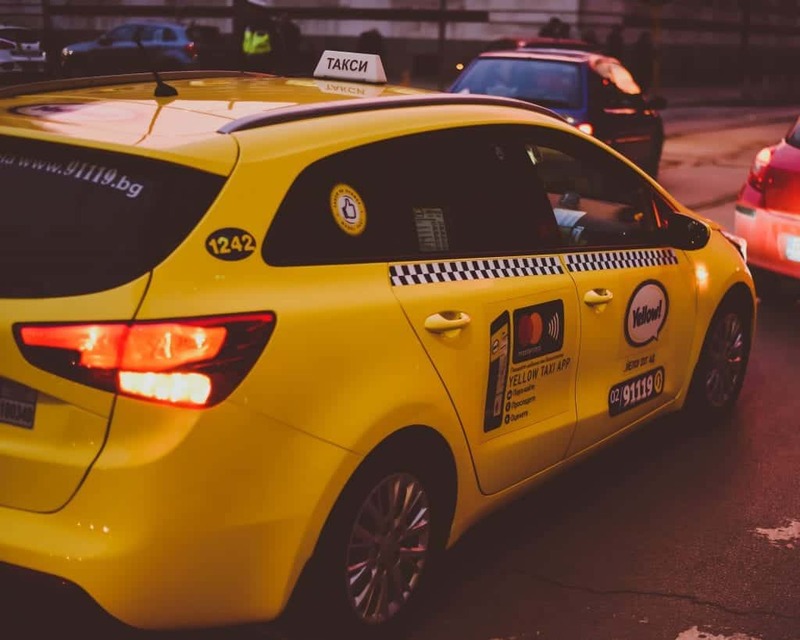 Read our Sofia taxi guide before you leave so you can watch out for common Bulgarian taxi scams. You need to have the cash to pay for the ride unless you arranged with the driver to pay by credit card ahead of time. Never leave in a taxi without the cash or double checking with the driver that there is a working POS in the car. Expect the drive to take 45 minutes to an hour. If you arrive at the bus or train station in Sofia and want to take a taxi to your final destination, go to the taxi stand in front of the Central Bus Station. To avoid scams, only use this taxi stand and do not get into any other taxi. This part of town is notorious for taxi scams. You can read more tips about taking taxis from here and avoiding scams in our Sofia Taxi Guide. If you are arriving by taxi, make sure you have the Google maps for Sofia ready to go, since your driver may need help with navigating to your final destination. If you are headed to Pernik to attend Surva, read our photo-essay on the Kukeri dancers.